To find out more about my lab, follow the link in the toolbar on the left marked "Christa Mulder's Research, Teaching and Outreach" or go to https://sites.google.com/a/alaska.edu/cpmulder/. Chair, Department of Biology and Wildlife, University of Alaska Fairbanks (UAF) (July 2010-present). Professor, Institute of Arctic Biology and Department of Biology and Wildlife, University of Alaska Fairbanks (July 2012-present). Assistant Department Chair (Graduate Program), Department of Biology and Wildlife, University of Alaska Fairbanks (January–June 2010). Associate Professor, Institute of Arctic Biology and Department of Biology and Wildlife, University of Alaska Fairbanks (July 2006-June 2012). Assistant Professor, Institute of Arctic Biology and Department of Biology and Wildlife, University of Alaska Fairbanks (Jan. 2001-June 2006). Lecturer (Assistant Professor) in Ecology, School of Biological Sciences, Victoria University of Wellington (VUW), New Zealand (Feb. 1998-Dec. 2000). Post-doctoral fellow, Swedish University of Agricultural Sciences, Umeå, Sweden (May 1996-Jan 1998). Wipf, S., Rixen, C. & Mulder, C.P.H., 2006. Advanced snowmelt causes shift towards positive neighbour interactions in a subarctic tundra community. Global Change Biology, 12, pp.1496–1506. Jumpponen, A. et al., 2005. Winners and losers in herbaceious plant communities: Insights from foliar carbon isotope composition in monocultures and mixtures. Journal of Ecology, 96, pp.1136–1147. Rixen, C. & Mulder, C.P.H., 2005. Improved water retention links high species richness with increased productivity in arctic tundra moss communities. Oecologia, 146, pp.287-99. Spehn, E.M. et al., 2005. Ecosystem effects of biodiversity manipulations in European grasslands. Ecological Monographs, 75, pp.37–63. Armbruster, W.S. et al., 2004. Phenotypic Integration – The Evolutionary Biology of Complex Phenotypes. In M. Pigliuci & Preston, K. A. Oxford, UK: Oxford University Press, pp. 23–49. Mulder, C.P.H. et al., 2004. Species evenness and productivity in experimental plant communities. Oikos, 107, pp.50–63. Hector, A. et al., 2002. in: The functional consequences of biodiversity: Empirical progress and theoretical extensions. In Oxford University Press, pp. 71–93. Armbruster, W.S. et al., 2002. Comparative analysis of late floral development and mating-system evolution in tribe Collinsieae (Scrophularia s.l.). American Journal of Botany, 89, pp.37–49. Drake, D.R. et al., 2002. The biology of insularity: an introduction. Journal of Biogeography, 29, pp.563–569. Jumpponen, A. et al., 2002. Interspecific and spatial differences in nitrogen uptake in monocultures and two-species mixtures in north European grasslands. Functional Ecology, 16, pp.454–461. 2008-2009 National Education Fellow in the Life Sciences, National Academies of Science, USA. 2007 National Science Foundation Research Coordination Network: “SEAPRE: Seabird Islands and Introduced Predators: Impacts of Presence and Eradication on Island Function” (PI, $247,000). 2006 Center for Invasive Plant Management: “Assessing wildfire burn susceptibility to invasive plant colonization in black spruce forests of interior Alaska”. (PI; with K. Villano and T. Hollingsworth, $5,000). 2003 National Science Foundation: “Rats on islands: direct and indirect effects on plant communities” (PI, $392,000). 2003 Western Regional Center (WESTGEC) of the National Institute for Global Environmental Change (NIGEC): “Will global warming alter plant parasite loads in the boreal understory?" (Co-PI; B. Roy PI., $244,000). 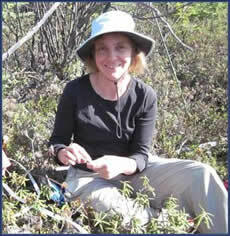 (23 April 2012) Climate warming is allowing invasive plants to take hold in Alaska and possibly luring pollinators away from native berries, says University of Alaska Fairbanks ecologist Christa Mulder. Member, National Science Foundation panels, 2002, 2003, 2004, 2006, 2008, 2009. Co-organizer for “Ecology of Insular Biotas” conference held in Wellington, New Zealand in February 2001. This conference attracted 170 participants from 20 countries. Guest editor, special issue of Journal of Biogeography on Ecology of Insular Biotas, 2001-02. Ad-hoc reviewer of grants applications / reports for National Science Foundation, National Geographic, US Forest Service, Murdoch Charitable Trust (US) , Ecological Society of America, NWO (Netherlands), Bicentennial Program for Science and Technology (Chile), and Swiss Science Foundation. Program Review Committee for the Department of Biology and Wildlife and lead author of the departmental report submitted to the committee. Chair (2003-2004), co-chair (2004-2005) and member (2002-2003) of the Graduate Academic & Advisory Committee of the Faculty Senate. Chair (2006-2009) and member (2005-2006) of the teaching advisory committee (TAC). Chair, ad hoc committee on the “botany” curriculum, 2005-2006. Member of the research advisory committee (Spring 2006- Spring 2008). Member of the following search committees at UAF: Assist. Prof. in. Plant Molecular Systematics, Executive Officer, Institute of Arctic Biology (2001), Assist. Prof. Wildlife Ecology, (2001-2002), B&W office manager (2009) , IAB greenhouse manager (2008), Unit Leader, USGS Cooperative Unit (2010). Coordinator for the seminar series in Ecology and Evolution, Victoria University of Wellington, 1999 and 2000. Coordinator, Faculty - Graduate seminar series, Dept of Biology and Wildlife, UAF, 1992-93.